Stencils are useful for marking everything from boxes and bins to stacks of lumber. 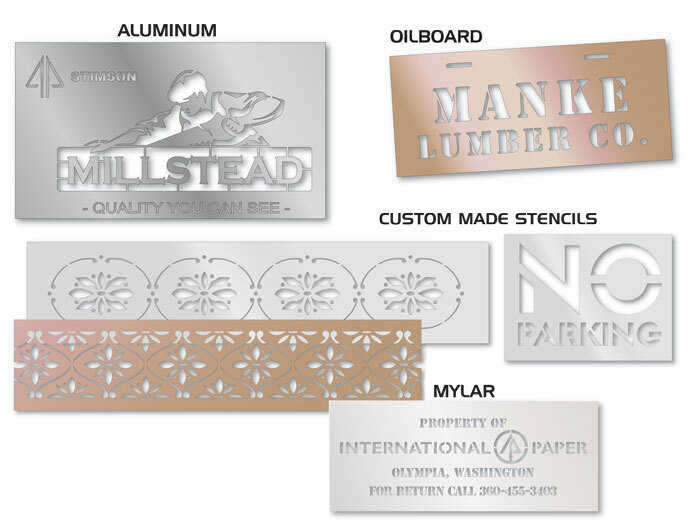 Our stencils are available in oilboard, mylar and aluminum, any size. with handles and hangers. Through our integrated computer graphics system, we can duplicate your logo into our milling machines. We can also make stencils with changeable information for lumber sizes and grades. Stencils are a great way to mark equipment on a construction site. With a little spray paint you can stencil your logo and/or company name on toolboxes and lumber, or create a quick sign to mark a worksite for your employees to easily find. If you don't require a large stencil, we can manufacture a smaller one to meet your needs. We also carry a full line of MARSH stencil's and inks (see below). Marsh inks for every marking need - Marsh produces its own inks under the strictest quality control and has the widest selection in the industry. Marsh Foundation Rollers and Brushes - The first with pump action for fast, uniform dispensing of ink for strong, clear marks -- no ink fade-out, no ink flooding. P.T. Templet's Stencils include letters A to Z, numerals 0 to 9, dollar and cent symbols, period and comma, plus one extra A, E. O, R, S and period. These stencils are made from heavy stencil board, .015 inch thick. Their large borders allow for variable spacing and prevents over spray. Interlocking Brass Stencils guarantee straight lines and easy to read characters. Contact our customer service staff with any questions or to place an order.